Your gift to the medical Stella Fund on #GivingTuesday provides so much more than a simple surgery – you are giving the gift of life! Thousands of injured and sick homeless pets pour into ACCT Philly every year, and they have no one but you to save them. All gifts made on #GivingTuesday, November 27th, 2018 will be immediately put to use to save pets like Addie, a young cat whose front leg was so damaged she needed immediate amputation. Thanks to your support of the Stella Fund, her injured leg was removed and now she is happy, healthy, and loving life with her devoted adopter! Questions? Contact Morgan Polley, our Communications & Development Specialist at mpolley@acctphilly.org or 267-385-3800 x136. Mailed checks can be sent to: ATTN Development, 111 W Hunting Park Ave, Philadelphia, PA 19140. Named after a beloved cat adopted from ACCT Philly, the Stella Fund provides medical care to pets who have no one else. With simple surgeries or treatments, the Stella Fund transforms these hurting pets into healthy, adoptable animals, allowing us to focus on finding them forever homes. Treatable or manageable medical conditions shouldn’t become life-threatening simply due to cost of care. Thanks to you and the Stella Fund, more and more injured pets are receiving the greatest gift of all: a second chance! Stella represents the possibility that exists, with your support, for every individual homeless animal who passes through our doors. Stella was one out of many cats at ACCT Philly, but she is perfect for her adoptive family, filling their lives with love and great joy. Each pet here has the same potential to brighten someone’s life… and you have the power to make it happen. 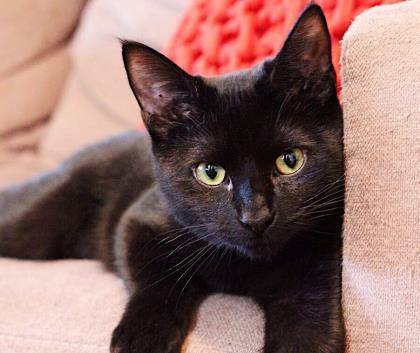 Abandoned at the shelter with life-threatening birth defects, Miracle is now a healthy and loved pet! 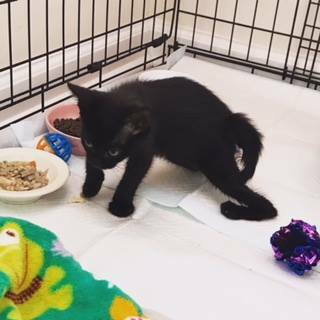 Only a few weeks old, Miracle was surrendered to the shelter, born with birth defects that could kill her if left untreated. Her intestines hadn’t formed correctly, and her tail and one hind leg were so deformed she couldn’t use them. The only way we could save her little life was emergency surgery and amputation. Hundreds of sick and injured animals like Miracle come into our shelter each year, and they count on you to give them the lifesaving treatment they need and deserve. As an open-intake shelter receiving thousands of animals every year, treatable injuries and illnesses – such as broken limbs, birth defects, or eye infections – end up putting some saveable animals at risk for euthanasia. With your help, we can change that. By supporting our Stella Fund, you can save these lives. Your donations let us provide lifesaving medical care for homeless animals like Miracle. You can help them become healthy, thriving family pets. Miracle’s leg amputation was paid for and performed here at ACCT Philly, and her tail amputation and x-rays were completed by generous partner organizations. Her dedicated foster mom made sure Miracle made it through her surgeries and appointments, and found her the perfect purr-ever home! Because of you, Miracle is a happy and healthy house cat, free from pain. Give more homeless pets the chance at a happy, healthy life by donating to the Stella Fund this #GivingTuesday! Last year we raised almost $4,000 in just 24 hours. This year, help us reach our goal of $6,000 raised during #GivingTuesday. Every dollar donated will help us provide simple yet lifesaving surgeries and treatment for hundreds of animals in our care. Help us give these loving pets the second chance at life they deserve. #GivingTuesday is a day of global giving fueled by the power of social media and collaboration.Celebrated on the Tuesday following Thanksgiving (in the U.S.) and the widely recognized shopping events Black Friday and Cyber Monday, #GivingTuesday kicks off the charitable season, when many focus on their holiday and end-of-year giving. Questions? Contact our communications and development specialist, Morgan Polley, at 267-385-3800 x136 or mpolley@acctphilly.org. Learn more Giving Tuesday.